red - cranberry, white - plain, and blue - blueberry. 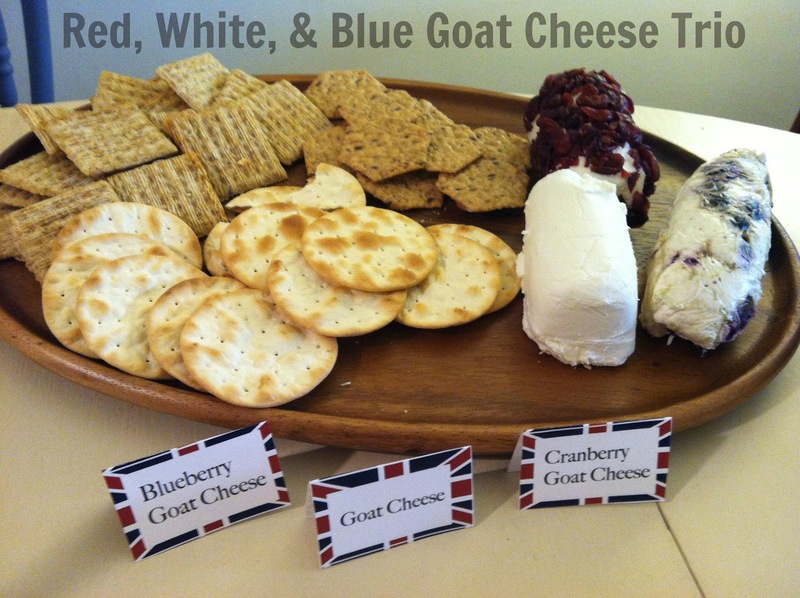 For the blue - blueberry, I rolled the goat cheese roll thin, smashed up some fresh blueberries, and squished together. For the red - cranberry, I covered the goat cheese roll in dried cranberries. I wrapped both in saran and set in the fridge for 24 hours. Finished off with a variety of crackers, it was an easy, special twist on the traditional cheese & crackers. I would love to try this with other fruits; I am thinking balsamic strawberries would be delicious! PS: Check out my Pinterest board of inspiration for my party. omg you are so cute! i love this idea so much. I love cheese (especially goat cheese), so this looks so yummy to me!